An attempt to answer the question of Possibility of Scientonomy - The Argument from Nothing Permanent which states "If there were indeed nothing permanent in science, then scientonomy would be impossible, however, scientonomy posits only that there are regularities in the process of scientific change." Response to the Argument from Nothing Permanent was formulated by Hakob Barseghyan in 2015.1 It is currently accepted by Scientonomy community as the best available theory on the subject. All previous responses to the Argument from Nothing Permanent seem to target the nothing permanent thesis: there are no permanent features in science. One way to answer would be to say that there is a permanent method of science, the scientific method. This was implicit in the beliefs of philosophers of science from Whewell and Herschel up to about 1970.2p. 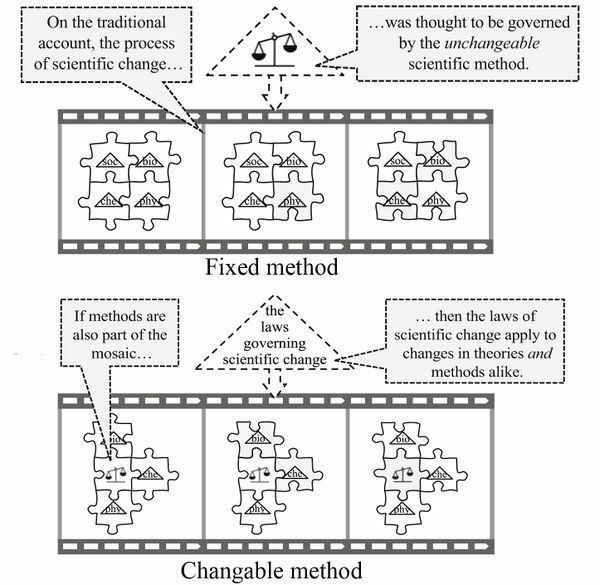 213 However, it is now commonly held that the scientific method is changeable, see for instance Feyerabend's Against Method.3 See the page on Possibility of Scientonomy - Argument from Changeability of Scientific Method for more details. The sociology of scientific knowledge, developed by Barnes and Bloor, argues against the underlying rationalism within the internal factors of scientific change, and instead proposes that the external sociological factors are the best description of scientific change.4 This denies the nothing permanent thesis by supposing the permanent features in scientific change are encompassed by sociology. See the page on Possibility of Scientonomy - The Argument from Social Construction for more details. Most similar to the scientonomic stance is that of Laudan's reticulated model.5 Laudan postulates that although theories, methods and axiological values are all transient in science, there is still a model to account for their behaviour. Laudan's reticulated model describes relations between three levels of hierarchy; theories, methods and aims. Unlike other theories of scientific change, Laudan's reticulated model acknowledges a changing method of science that is influenced both by theories and also aims. He describes the interactions between theories, methods and aims as follows: theories constrain methods, while methods justify theories; methods realize aims, while aims justify methods; theories and aims must harmonize.5p. 63 Laudan's model provides a mechanism of scientific change which can account for dynamic methods, shifting aims and the developing criteria needed by theories in order to be accepted. This reticulated model provides a dynamic that explains the process of scientific change—it posits that the underlying feature of science is its reticulated model. Thus, Laudan denies the nothing permanent thesis by proposing a mechanism that governs how science changes. Response to the Argument from Nothing Permanent (Barseghyan-2015) is an attempt to answer the following question: How can scientonomy be possible if there are no permanent features of science? See Possibility of Scientonomy - The Argument from Nothing Permanent for more details. Although both the theories and methods of science have changed over history and differ across disciplines, the nothing permanent thesis is denied. Instead, the fixed and stable features of science can take the form of dynamics or laws that govern changes in science through a piecemeal approach. A theory of scientific change is possible by positing laws that describe transitions in science and its constituent elements. Although it is generally accepted that there seems to be no static transhistorical properties of science, this does not deny the possibility of laws governing the process of scientific change in a piecemeal fashion. Theories have, of course, proven themselves to be changeable. Methods of practicing and theory appraising have also proven to be changeable. The aims, goals and philosophies behind what science ought to be have also clearly changed. However, although a case can be made for these static properties of science to be non-permanent, perhaps the fundamental mechanism governing how these properties change can be permanent. Hence, the absence of static properties in science fails to show the impossibility of a general theory of scientific change. There is the possibility of a mechanism of scientific change that governs the changes in theories, methods and other elements of science. This page was last modified on 7 December 2018, at 07:15.